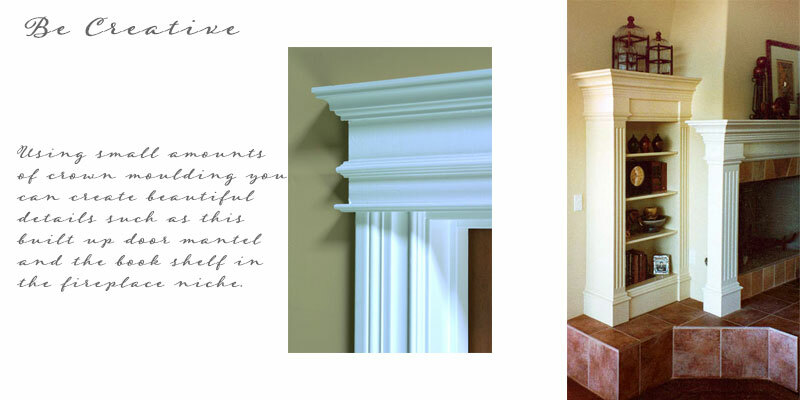 Crown moulding is first on our list because it is the most dramatic improvement and gives the most "bang for the buck." 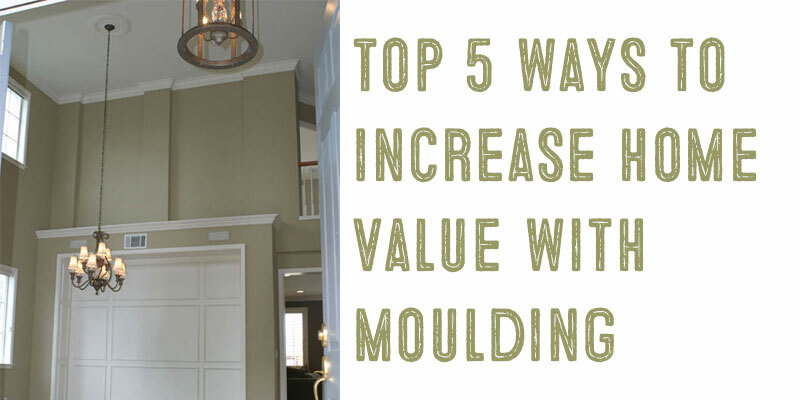 Don't be afraid to use crown moulding in small rooms, and don't hesitate because the ceiling height changes, or cabinets or chimneys protrude from the wall surface. In this home, which is a brand new home purchased as an investment in the East Bay, the owner, a banker, selected crown, base and casings throughout the home to give it more detail and and the warm feeling that wood trim gives to a home." Visit this east bay investment home. 2. PAINT Be sure to use paint with enough contrast to the color of the moulding. See COLOR PAGE for more information on color and moulding. 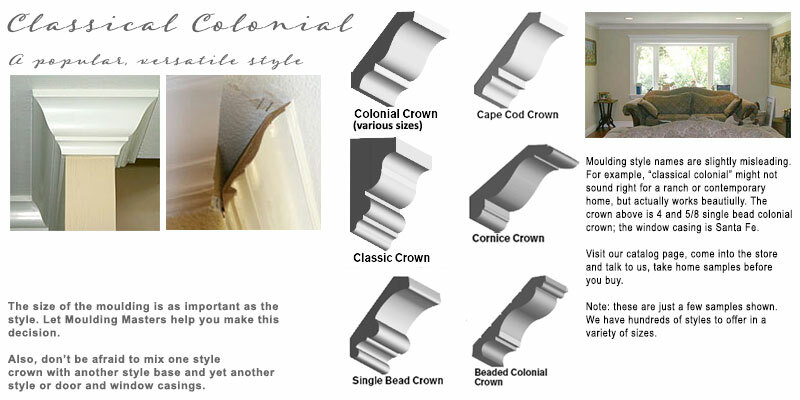 "This Old House" host Tom Silva has an excellent video that will give you an overview of what mouldings are and how to use them. This video will help you with moulding terminology. 3. DOORS AND DOOR CASINGS Glass doors are really popular in the fix and flip market, increasing interior light and adding a pretty look. We are recommending larger sizes of casing and nice mantels over doors to give them emphasis and increase their visual appeal. 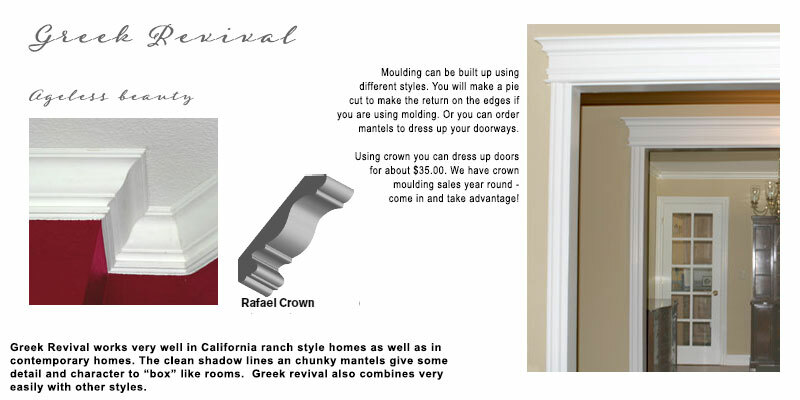 See the door mantels in the Greek Revival section in #4 - a lot of look for very little money! The guides above might help you get started, but we also suggest visiting our store or giving us a quick call at (925) 689-7332. With years of experience helping customers beautify their homes, we can suggest samples for you to take home and try, saving you expensive mistakes. Visit our PROJECTS page to see installations for ideas. 5. BE CREATIVE! If you are using a neutral pallete be sure there is enough contrast between the wall color and the crown. Big chunky crown looks fabulous with modern furniture. Consider ceiling treatments - coffered ceilings really create interest and look wonderful with traditional or modern furniture. Don't be afraid of color - take a look at the Disney colors for kids rooms. If you are selling a home, use colors that appeal to a broad audience but don't be afraid to give the home style! Call us at (925) 689-7322 and we will be delighted to help you!